When the alarm rings at 4 am, it is way too early.....and still oh so very dark outside. One year ago today, I moved into my new house. Wow. I almost can't even believe that it has been a whole year!!! I was so very blessed to find a home that didn't require a lot of work -- not even really any painting! Still, it took a while to get settled and find a new home for all my stuff (and why do I have so much stuff?!?!). Anyway, I am so thankful for my house. And determined to open up the doors more often this year to host family and friends. Courtesy of Callapidder Days....my list of books to read between Sep 23 and Dec 21. Doubt I will make it through them all, but who knows? A few are loaned from my brother-in-law, Phillip, a couple are books that I won throughout the Spring in giveaways by Callapidder Days, the rest are from my friend Allyson who recently moved. I thought this movie sounded great when the previews first started showing. Somehow, though, I never made it to the theater to see it. I finally rented Wild Hogs tonight......and it didn't disappoint. The sight of the motorcycles was enough to keep me interested, but it is really very funny too. Laugh out loud so I can hardly breathe funny at several points. I'd highly recommend it. While the super Dolby surround sound of a theater probably would have enhanced the beautiful sound of the Harley pipes, watching the movie at home was just as satisfying. Headed now to finish up laundry, then a good long night of sleep. 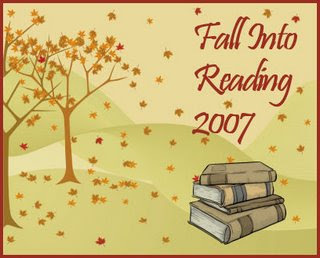 Be watching this weekend for my entry into Fall Into Reading hosted by Callapidder Days. My friend Allyson recently moved and unloaded a lot of books onto my shelves, so I've got quite the list of upcoming books. So my question of the day is this......why did I have to get new license plates? I bought my car in November 2000. So, this November will be 7 years that I've had my car. When I renewed the registration, they sent me new license plates. WHY?? I went on another scrapbook retreat this last weekend. And ..... drumroll, please ..... I finished my scrapbook! It started with my surprise 30th birthday party last year, covered my trips to New York and Germany, the purchase of my house last fall, and Christmas. Yay!! Now, I just have to decide if I have enough scrapbook-worthy things going on to start another.....or just come up with other projects for retreats. My favorite part of these retreats is just being able to sit around a visit with these ladies from church that have become such mentors and friends. Church can be so hectic trying to chase kids, meet commitments, etc that it is hard to have time to really visit. These retreats provide hours and hours to talk, laugh, cry, and share with each other. It is so good. One year ago on this day of September 15, I signed scads of papers and officially became a homeowner. Yikes. My friend Kelly came over last Thursday night and helped me re-think and reorganize my scrapbooking supplies and craft closet in my office. I don't have any "before" pictures, but the after make me very happy. Now I am able to find and pull out exactly what I need, rather than having to open and unload every container. We both love to organize and actually this was payback to me for a fun Saturday about four years ago when we spent the day organizing her closet. Then over the weekend, I have been creating a quote canvas to hang in my dining room. I had never painted on canvas before, so it was a unique experience. It really wasn't as hard as I thought it would be. I spent about 20 minutes priming the canvas with gesso on Friday night, spend about 30 minutes Saturday night rolling on the background color, and only about an hour today painting the words. I'm pleased with the result - no it is not perfect, but I think it looks pretty good for a novice! I'm planning to do another canvas for Christmas decorations and swap them out.